If you are planning to share copies of this Ebook with students in your classroom, please also purchase the NH102E Classroom License. 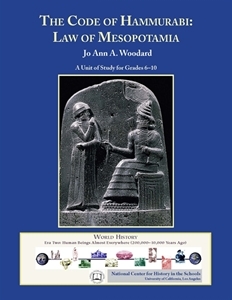 This unit examines various law codes of the sophisticated culture of Mesopotamia. Students will read the precedent-setting case of "The Silent Wife" and examine how societies arrive at a system of justice by drawing on both divine and natural laws.